The Elantra is Hyundai’s 4-door compact car and is the smallest sedan in Hyundai’s lineup. The Elantra is Hyundai’s second best-selling vehicle behind the larger Sonata. The Elantra is all-new for 2017. The exterior has been completely redesigned, and its smooth lines coupled with its adoption of Hyundai’s signature hexagonal grille makes it look like the Sonata’s smaller, sporty sibling. The Elantra’s interior is significantly more upscale for 2017, and the back seat now has slightly more leg-room. Also new is an upgraded sound system, and a host of available technologies in higher trim levels, including Android Auto and Apple CarPlay. SE and Limited models come with Hyundai’s new 2.0-liter 4-cylinder engine, and drivers interested in sacrificing some power for increased fuel economy can now choose the Elantra Eco, whose turbocharged 1.4-liter engine returns better gas mileage than the 2.0-liter engine. All Elantra models come in front-wheel drive, although the base trim-level can be had with a manual transmission for those who prefer their cars to come with three pedals. The Elantra’s 147-horsepower puts it ahead of perennial best-sellers like the Corolla and base-level Camry, and Hyundai has made major strides with the Elantra’s suspension, making it much quieter and smoother at highway speeds. 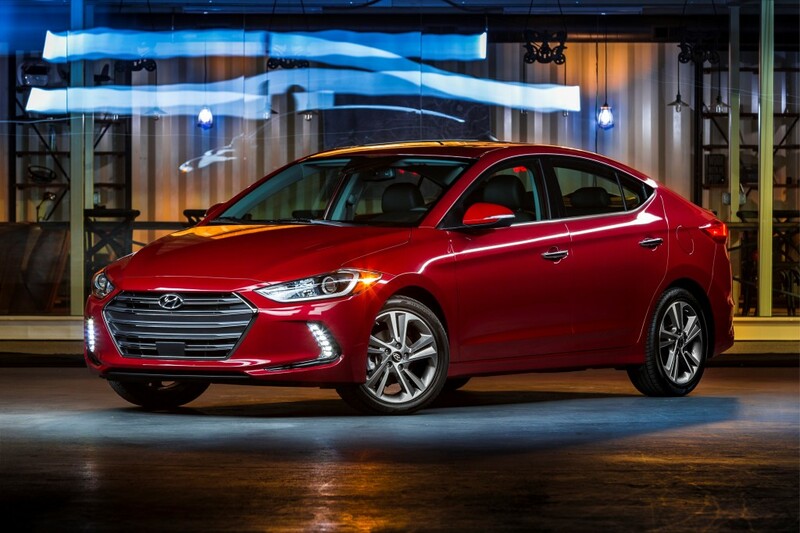 Automatic Elantras return a highly-respectable EPA-estimated 32 combined MPG, and the six-speed automatic transmission has been widely praised for offering smooth driving around town and at highway speeds. While the average consumer would notice the Elantra’s stylish new exterior before anything else, people familiar with previous generations of Hyundai’s compact sedan will be absolutely bowled over by what Hyundai has done for the Elantra’s interior. Everything, from the buttons on the steering wheel to the various available infotainment systems, is intuitive and comfortably within reach. The Elantra is a touch wider for 2017, and no-where is that more apparent than on the dash, where big, clearly labeled buttons make every aspect of the in-car experience a treat. Attractive leather seats are available in higher trim levels, but every trim level now has better interior materials and more tastefully-designed trim – the Elantra’s interior now features smoother plastic and brushed metal that make it look legitimately futuristic. If you, like many American consumers, are looking for an affordable, dependable sedan that offers a smooth ride, good fuel efficiency, and attractive styling, then the Elantra is worth your serious consideration. Its competitors, like the Civic and Corolla, have been among the nation’s best-selling vehicles for decades, but 2017 sees the Elantra leapfrog Toyota’s perennial volume-leader in both Car and Driver’s and the U.S. News and World Report’s compact car rankings. The Elantra has arrived, and the rest of the industry is officially on notice. Previous Previous post: 2017 Hyundai Tucson – Rave Reviews from Its Fans!